For more information about this Proven Safety Countermeasure, visit the Office of Safety's Intersection Corridor Access Management web page. Access management refers to the design, application, and control of entry and exit points along a roadway. This includes intersections with other roads and driveways that serve adjacent properties. Thoughtful access management along a corridor can simultaneously enhance safety for all modes, facilitate walking and biking, and reduce trip delay and congestion. Every intersection, from a signalized intersection to an unpaved driveway, has the potential for conflicts between vehicles, pedestrians, and bicycles. 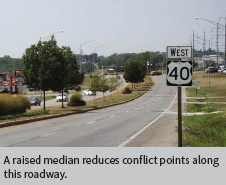 The number and types of conflict pointsâ€”locations where the travel paths of two users intersectâ€”influence the safety performance of the intersection or driveway. Driveway closure, consolidation, or relocation. Limited-movement designs for driveways (such as right-in/right-out only). 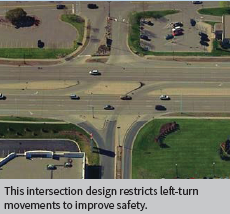 Raised medians that preclude across-roadway movements. 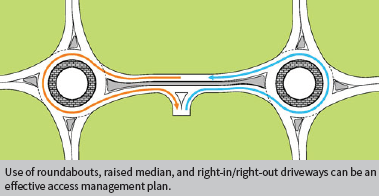 Intersection designs such as roundabouts or those with reduced left-turnconflicts (such as J-turns, median U-turns, etc.). Turn lanes (i.e., left-only, right-only, or interior two-way left). Lower speed one-way or two-way off-arterial circulation roads. Successful corridor access management involves balancing overall safety and corridor mobility for all users along with the access needs of adjacent land uses.